Eugal Belette is a Breton warlock living in Chorrol. He claims to be new in town, but carries a dark secret; he is a Mythic Dawn sleeper agent, and will attack you on sight upon the completion of the Dagon Shrine quest. Rumors around town reveal that other Chorrol citizens have noticed him acting strangely, and that odd noises have been coming from his house at night. As his basement is filled with Mythic Dawn paraphernalia and alchemy equipment, this might very well hold true. Furthermore, he spends the entire night down there, from midnight until his bedtime at 6am. He wakes up at midday, exits the house, and takes the small walk down to the Oak and Crosier, where he will spend four hours wandering around and talking with the other regulars. On the 4th, 5th, and 6th of each month, this will also include his "friend" Ulen Athram. At 4pm, he heads home, and once again enters the basement to spend another two hours down there. He surfaces at 6pm, when he will eat dinner on the ground floor in his house. At 8pm, it's time for his evening walk near the South Gate, where he will stroll around until midnight. His attire consists of a pair of doeskin shoes, a quilted doublet, and tan linens. He also carries around a copy of the Conjuration skill book Mythic Dawn Commentaries 1, his house key, and a small amount of gold. He knows all major Destruction spells and the standard Mythic Dawn Armor and Mace spell. When you approach him, he won't really tell you anything except his name: "My name is Eugal Belette. I'm pretty new here – don't know a soul." If you ask him about the city he lives in, you don't get much wiser: "I'm sorry. I'm new in town, and don't know anyone." 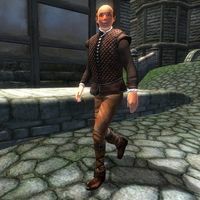 You can hear rumors about him when two NPCs talk: "I heard some strange noises coming from Eugal Belette's house." and "Have you heard the odd noises coming from Eugal Belette's place?" Other citizens will respond: "I'm not so sure about that Eugal Belette. An odd fellow, and people have said there are strange noises coming from his house at all times." and "Eugal Belette is an odd one... and I swear I heard strange noises coming from his basement not long ago." Even though Eugal spends a lot of time in the basement, he actually doesn't go into the locked room. He will spend all his time on top of the stairs, doing absolutely nothing. As a member of the Mythic Dawn, Eugal will attempt to kill Brother Piner if he detects him when he enters the city. He will attack anyone around him too, which may result in some quest-breaking deaths. It is advisable to attack him when this happens, to attract his attention away from vital NPCs. You can make him attack you at a time of your choosing by reducing his disposition to zero. Under some circumstances, large triangular lights and coffin shaped shadows (top half of exclamation point) will appear in the locked room in Belette's basement see Oblivion:Minor Glitches#Broken Candles. Esta página foi modificada pela última vez à(s) 01h08min de 20 de março de 2014.